Everyone has a different foot. That’s why we offer our deep footbed in two separate widths: a regular width for regular feet and a narrow width for particularly slim feet. And to ensure a perfect fit, our uppers are also adapted to each deep footbed width. Because the straps can be adjusted you’ll receive a custom-made shoe perfectly tailored to your feet. 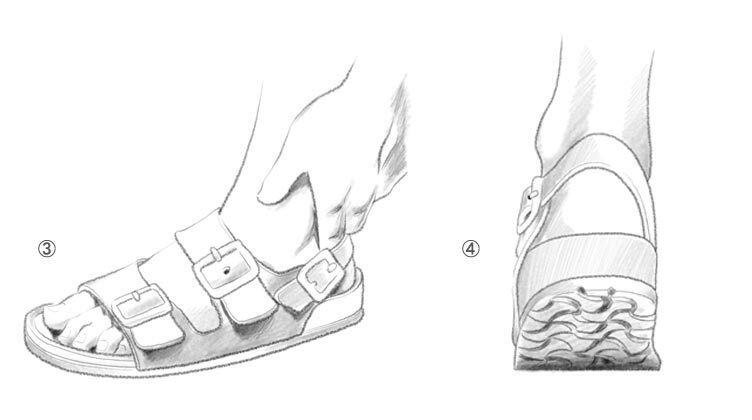 When you buy your BIRKENSTOCK model make sure there are a few millimeters of space in the heel and toe areas. Your toes need a little flexibility when you walk to ensure that can move freely with each stride. Shoes influence the way we move. That’s why it's important that they sit properly – both when you stand and when you move. Here are some tips to show you how you can adjust your BIRKENSTOCK model and enjoy incomparable comfort. Open all of the straps and place your foot in the footbed. Make sure there are a couple millimeters of space in the heel and toe areas. You’ll need this extra space for a natural rolling motion. In addition, your feet should be nestled in the footbed and not rest on the inside and outside of the footbed edge. Please remember that our footbed is available in two sizes. Close the straps so they do not sit too tightly. You should leave a little extra space so your feet are not constricted when you walk. For models with heel straps, make sure that the heel strap is not fastened too tightly, as otherwise your foot will be pushed too far forward in the bed. After you have adjusted your BIRKENSTOCK model you should take a few steps. If your feet can move freely when you walk and do not push against the footbed edge you have chosen the right size and width. Shoe size is a topic in and of itself. But most shoppers are probably not aware that there is no internationally recognized, uniform and standardized size system. Instead, there are a number of different systems. For example, the size information in Continental Europe is completely different from the information in the UK. There are still other standards in the US. In addition to the different units of measurement, there are also different reference values (foot, shoe or last) and different reference points used for measurement. As if it weren't already complicated enough, there is also a distinction among children's, women's and men's shoes in some cases. But that's not all: In many cases, the size information also differs depending on the type of shoe, last form and manufacturer – and sometimes these differences are significant. If you're not sure what your current shoe size is, you can use the table below to figure it out. Please note, however, that the information is only intended as a rough guide, as depending on the model and product line there may be slight differences in the last construction and underlying size system. The best thing to do is to measure your foot before you order. To do this, place your foot, wearing a sock, on a piece of paper and draw an outline around it using a pen or pencil. Then mark the length of your foot (from the heel to the big toe). Measure the distance between the two points using a ruler and compare the result with the information in the following conversion table. If your foot length is, say, 27.0 cm, according to the table below the right shoe size for you is 42. If the length of your foot is 24.5 cm, you should order your shoes in size 38. If, for example, your foot length measures 24.8 cm, a shoe size of 38.5 is the right one for you. BIRKENSTOCK does not offer half sizes. In these cases, we recommend that you select the next larger size. Here, that would be size 39. BIRKENSTOCK models are generally available in sizes 24 to 50. However, not all products are available in all sizes. Styles such as the Milano are always available in all sizes. But there are also styles that are for children or adults only. Sandals without a heel strap, such as the Gizeh or Madrid, are available for children in sizes 30 and up. One big advantage of BIRKENSTOCK products is that they are very true to size. Once you've found the right size as an adult, you can generally be sure that all BIRKENSTOCK models in the same product group will have the same fit – and you'll be able to order your favorite model again and again without having to remeasure your feet each time. The original BIRKENSTOCK footbed is made of delicate natural materials (natural cork, natural latex, jute and suede). The velvety soft top layer, which faces the foot and is made of high-quality suede, is very delicate. Wet or dirty soles will leave marks on the footbed. So please be sure that your feet are dry and that you wear regular or disposable socks when you try your shoes on. That the size of a shoe is important for how well it fits is no secret. But less well known is the important role that width plays. This is because if your shoe is too tight in the area around the balls of your feet, it will press against your metatarsophalangeal joints. This is not only painful – over the long term, shoes that are too tight could also lead to misalignments. But if they're too loose, your heel will lift up from the shoe. Your foot will then slide forward and your toes will push against the front of the shoe. This might explain why people buy shoes that are too wide and too short. However, even if the person wearing the shoe feels better, the problem posed by shoes that are the wrong width is not solved – it's merely shifted. In this case, a misalignment of the foot is inevitable. The right shoe width will hold your foot firmly in place at its widest point – the area of the ball line – without constricting it. The ball line is the imaginary line between the balls of the big and small toes. Because foot size changes over the course of the day as a result of pressure (your feet are bigger at the end of the day right before you go to bed than when you first wake up), you should be sure to have sufficient room on the sides. Most shoe manufacturers only have one standard width. Fashionable shoes, in particular, are usually cut too narrowly in order to make the foot look more slender. The logical consequence: pressure points, painful feet and severe complaints. BIRKENSTOCK offers most of its models in two widths: a standard width for normal feet, and a narrow width for smaller feet. In addition, many models are adjustable. 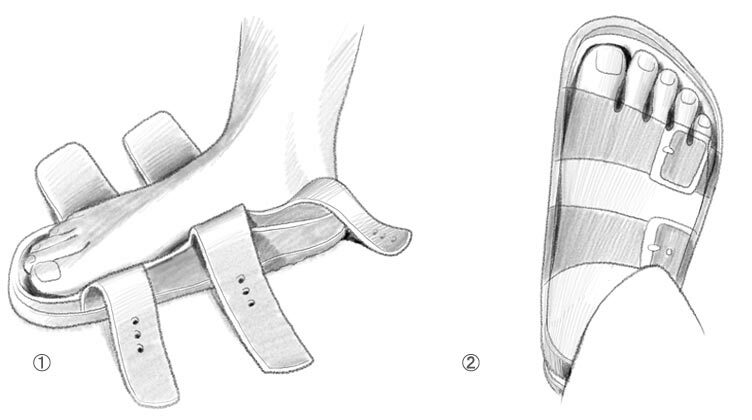 You can use the straps and buckles on BIRKENSTOCK sandals and shoes to adjust them individually to fit your foot. This ensures a high level of comfort.